For more information and to register, click on an event! Email institute@rawsonsaunders.org with any questions or call 512-350-2844. Participants in this Neuhaus-developed program develop strategies for teaching phonological awareness, letter recognition, oral language, and the alphabetic principle, all of which heighten students' awareness of words and sounds to develop the essential skills that lead to reading success. Neuhaus Education Center's Reading Readinessmanual is included in the course fee. This indispensable resource covers letter recognition, phonological awareness, oral language, multisensory letter introduction, and handwriting. Reading Readiness is a prerequisite for the Rawson Saunders Basic Language Skills Introductory Course. This two-week introductory course provides a research-based approach to teaching essential literacy skills such as phonological awareness, letter recognition, decoding, comprehension, spelling, grammar, and written composition. The course involves intensive training in a therapeutic, multisensory, Orton-Gillingham based curriculum for effectively teaching phonics and language structure to students with dyslexia and other reading challenges. The BLS Introductory Course was developed at Neuhaus Education Center in Houston, Texas, and is a requirement for the Dyslexia Therapist Preparation Program. This is a 12-day course, including two days scheduled after the 2-week class. Materials for the program are included. The application process will include an interview and an observation of a BLS lesson. Please contact us to make an appointment. The lessons introduce strategies for understanding narrative text, expository text, poetry, and graphs. Manual and materials included. Voracious Vocabulary is an interactive seminar on research and the “hows” of vocabulary instruction. In addition, attendees will gain insight into choosing vocabulary words that make the best choices for instruction. Teachers and tutors also experience innovative vocabulary lesson plans, including engaging activities for introducing vocabulary to students. The Multisensory Grammar Workshop offers a unique and imaginative format for the instruction of grammar, syntax, and composition. Participants learn multisensory ways to take this abstract idea and make it concrete, understandable, and fun. Participants also learn strategies to help students apply their knowledge of grammar into paragraph and multi-paragraph writing. Multisensory Grammar manual and materials are included. Dyslexia and the iPad showcases iPad apps and accessibility features that our dyslexic students and their teachers have found especially helpful since the launch of our 1:1 iPad program. We focus on apps to support reading and writing skills and provide guidelines for evaluating apps on student dyslexia-friendliness. We provide a list of general-use and math apps that we recommend for student use, as well as some apps for use by classroom teachers. Bring your iPad! A hands-on demonstration of some apps will follow the presentation, and you may want to follow along on your own device. Join us for a Morphology Workshop where participants will acquire strategies with which to build their students' morphological awareness. Participants discover the parts of Basic Language Skills that require morphological instruction. Workshop attendees practice BLS morphology lessons using multisensory, discovery-based instructional approaches. The two-week BLS Advanced Course builds on the concepts presented in the Basic Language Skills Introductory Course. The BLS Advanced Course is based on the program developed at Neuhaus Education Center in Houston, Texas, and is a component of the Dyslexia Specialist Preparation Program. This is an 11-day course, including one day scheduled after the 2-week class. The mission of Rawson Saunders Institute (RSI) is to serve as a valuable resource for central Texas educators and to fully and effectively prepare educators to provide a proven, research-based, multisensory approach for teaching the basic language skills of reading, writing, and spelling to all students, including those students with language-learning difficulties, especially dyslexia. Continuing professional education credits are available for educators. Email institute@rawsonsaunders.org or call 512-350-2844 for more information about classes and the Dyslexia Therapist Preparation Program. The Rawson Saunders Institute (RSI) is an educational training center and resource for educators, parents, and others interested in learning the Rawson Saunders research-based, multisensory approach to teaching essential language skills. Basic Language Skills, developed at Neuhaus Education Center, is adapted from Orton-Gillingham instruction and is the core curriculum for RSI’s Dyslexia Teacher and Therapist Preparation Programs. * This intensive, therapeutic program meets the Texas Dyslexia Legislation guidelines and has been proven extremely effective with dyslexic students. ALTs in the ALT Lab Program have completed at least one year of the certification program and are working toward its completion under the supervision of the RSI’s Director of Programs. * RSI Dyslexia Preparation Programs meet the International Dyslexia Association’s Knowledge and Practice Standards for Teachers of Reading, Texas licensure requirements, criteria for membership in the Academic Language Therapy Association, and are approved by the International Multisensory Structured Language Education Council (IMSLEC). Students’ placement in the ALT Lab Program is determined by matching student needs with ALT experience and relevant course work completed. Under the supervision of our team of qualified instructors, ALTs plan and provide appropriate lessons based on the student’s needs. Lessons are customized for each child, and instruction is individually paced. Instruction builds on student success, and a consistent schedule of three or four 1-hour sessions each week is required to ensure student mastery of essential literacy skills. Students are regularly assessed to monitor progress and guide instruction. Progress reports are submitted to the Director of Programs and are provided to parents on a quarterly basis. RSI is one of a handful of school-affiliated training centers in the country and it adheres to the high professional and ethical standards established by the International Multisensory Structured Language Education Council (IMSLEC) with therapist certification conferred by ALTA, the Academic Language Therapy Association. RSI is a partner with Neuhaus Education Center. 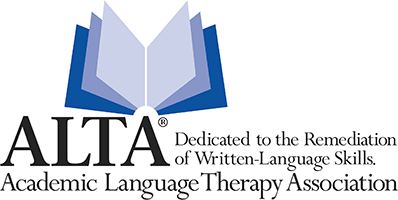 The RSI Therapist/Practitioner Program is recognized by the International Multisensory Structured Language Education Council (IMSLEC), meets requirements for Texas licensure, and meets criteria for membership in the Academic Language Therapy Association (ALTA).